WITH THE DISSOCIATIVES debut album now in stores, the band has announced a limited number of Australian concerts in June and July. The 14-date tour will start in Hobart on June 8 and finish at the NEWCASTLE ENTERTAINMENT CENTRE on July 3. 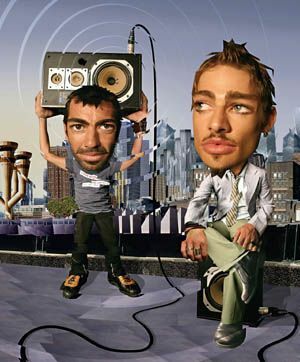 It will be the first round of dates for The Dissociatives, a new group which features the combined talents of SILVERCHAIR frontman DANIEL JOHNS and ARIA -winning electronic guru PAUL MAC. Their debut single Somewhere Down The Barrel has already proved a hit after becoming one of the most played songs on Australian radio. Critics have given The Dissociatives' self-titled album glowing reviews. Rolling Stone called it ``. th. th. unlike anything ever produced by an Australian act. A pop/rock record for the ages, to be placed up alongside your BEATLES and BEACH BOYS discs''. Johns, who capped off Silverchair's highly successful Across The Night Tour last year, said he was anticipating his return to the live scene. ``I'm really looking forward to this tour which is not something I'd usually say,'' Johns said. Mac said they had been eager to tour since forming the band in late 2003. ``We actually put the live band together late last year and rehearsed for a few weeks,'' Mac said. ``We all enjoyed playing the songs so we just know this tour is going to be fun.'' The Dissociatives will be supported by Perth outfit LITTLE BIRDY , now recording their debut album. Tickets for the tour are on sale from TICKETEK on 4921 2121.